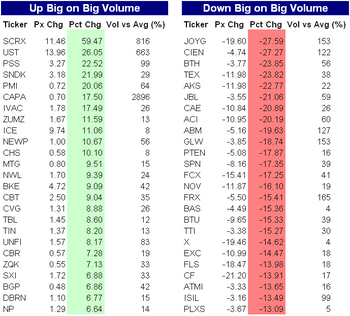 At the end of a short but volatile week we looked at some of the stocks that had large moves on above average volume (this week we omitted those stocks with light volume because it was a short week). Below we show the stocks that were both up and down strongly, sorted on percent. Many of the stocks that were up are either acquisition targets or smaller stocks, PMI for example where a 20% move equates to a $0.72 gain. There were however real winners, most notably ICE, BKE and CBT. On the right hand side, JOYG was down sharply on the week after missing earnings by 7 cents on Wednesday. ABM was another notable decliner on huge volume after its 8 cent earnings miss wiped out a year's gain on a seemingly steady uptrend.